These embroidery designs are only available in this club. 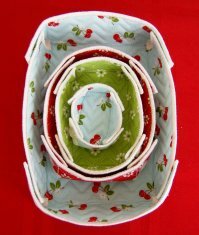 These Quilted Baskets by Kimberbell are quick & easy to make. Five designs in five graduated sizes. Choose from rectangle, square or hexagon shapes with fabric to match any décor. Ideal for organizing your sewing space, counter tops or using as a gift basket. All the hard work is done for you -- in the hoop! 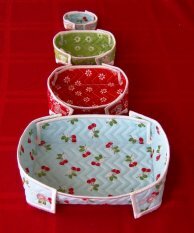 Quilted Basket files & instructions will be provided at the first class.